You all right read. This luxury yacht called the real «A». Her owner — a famous oligarch in Russia Andrey Melnichenko. According to «Business Insider» co-owner of capital «MDM Financial Group» and chairman of the board of directors of «EuroChem» consists of $ 11.4 billion. The vessel «A» is decorated with an incredibly lavish details. For example, the handle in the bathroom are estimated at $ 40,000 each. It has a touch-screen controls. Bedroom yacht is protected by a fingerprint scanner. Megayacht «A» is a luxury motor yacht designed by Philippe Starck in cooperation with Martin Francis and built by Blohm + Voss at Howaldtswerke-Deutsche Werft in Kiel, Germany. The contract for the creation of the yacht was signed in November 2004, and the ship was launched in 2008, which cost the owner about rumored to be about 300 million US dollars. 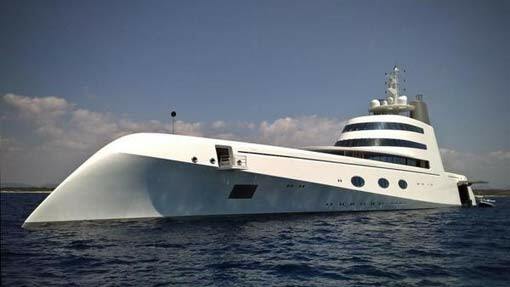 With a length of 119 meters and a displacement of almost 6,000 tons, it is one of the largest motor yachts in the world. Named after the first initial letter of its owners Andrew or his wife Alexandra Melnichenko, her provocative appearance polarized the views of the entire yachting world from the day of launching. This waterfowl caused comparisons with submarines and STELS warships, while commentators called the yacht «A» as «the most beloved and hateful ship in the sea».